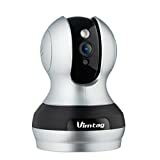 If you’re looking for an affordable, durable indoor surveillance camera, then this one from Vimtag might be one that you consider. Read our buying guide, packed with information to help you decide if it’s the right one for you. Do you always feel insecure about your family’s safety at home? Surely, you’ve always wanted to buy a security system but you firmly believe and think you can afford it. Well, se suggest that you think again because, you can actually secure your home without having to spend much. Purchase a security camera designed for indoor use. Specifically, you may want to opt for the Vimtag Surveillance Security Camera. 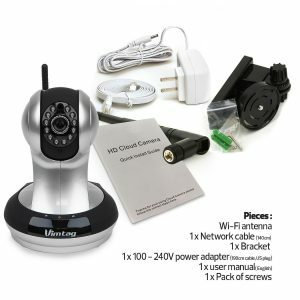 The Vimtag Surveillance Security Camera is a popular home security option. Definitely, this is worth your money as it has many impressive features. For a price you can afford, this security device can work excellently to give you peace of mind. One of the features that’s most useful is the motion detection. You can get a snapshot when motion is detected sent to your smartphone via the alerts function. There’s also a two-way audio feature which makes it useful for speaking to kids, or elderly parents. And you can also keep an eye on things and be aware if there are any problems or emergencies. You may also want to keep an eye on pets when you’re not home. Do you have a neighbor that says your dog barks all day when you’re gone? Find out if this is true, or not. You can also use this home security system for many years with its heavy and strong rubber material. There’s no need to spend extra, either, for any enhancement for high quality recording and capturing at night. Indeed, the Vimtag Surveillance Security Camera has an excellently clear night vision feature. Don’t worry about the specific function of the Vimtag Surveillance Security Camera. This is an all-in-one security camera that can protect and monitor your entire home. If you need the device for your pet, your kids or your properties, this innovative product is a perfect must-have. As long as you have a smartphone, tablet or computer, you can already monitor the goings-on at home the real time through the live streaming feature. The best news is that, you don’t need any browser or download an app to view your home from wherever you are. However, this unit does not offer cloud access. Instead the footage is recorded on an internal SD card. Then, you can access this footage remotely with the Vimtag app. What Accessories Does it Include? If you take a look at the reviews on Amazon (there are almost 5000 of them at the time of writing), you’ll see plenty of 4-5 star ones from satisfied customers. This camera does offer good picture quality and resolution, and is extremely easy to set up. The app works well for viewing remotely and getting alerts. However, there are also a number of 1-star reviews that mention security concerns. As in this thing is pretty easy to hack, change the password on, also change your Wi-Fi password, and gain access to your network, etc. The company has done very little to address this issue. So, buy this one if you must, but for our money? We’d probably stick with one of the better options found here: Top 5 Home Security Systems. Do you want to have peace of mind while you are away from home? Consider installing the Vimtag Surveillance Security Camera at home. With this innovative yet affordable security device, you can guarantee to have relaxed days and nights even if you’re miles away from home. There are a ton of features that you’ll appreciate in this reasonably priced security camera. Since you can do live streaming with this security camera, you can always call for rescue if an emergency takes place at home. Your nanny won’t even have the chance to do something inappropriate to your child because you can clearly see what’s going on inside your house with the HD quality of your camera. The most worrying thing about the Vimtag camera are the security concerns. If you take a look at the 1-2 star reviews on Amazon, a number of people mention this. There are a number of reports of this camera being hacked and things like Wi Fi passwords being changed. It’s for this reason that we don’t really recommend this product over some of the other, better options out there. For example, Lorex makes some excellent, secure systems, or you may want to consider one of these Smart Home Cameras instead. What are your thoughts about this home security device? Leave a comment below and let us know what you think. Also be sure to give this article a share on Facebook, Twitter, or Pinterest. Damon Kennedy is the expert on all things home security systems. He's been working in the field for 20 years, recommending and installing them for his clients, for both homes and businesses. He's excited to share his knowledge with you so that you can make the best choice! We’ve been reviewing Spy Gear since 2014 and our goal is to bring you the best, unbiased recommendations. spycamerasreviewed.com is a participant in the Amazon Services LLC Associates Program, an affiliate advertising program designed to provide a means for sites to earn advertising fees by advertising and linking to Amazon.com.